Offshore worker Barry Howie started playing the lottery online 6 months ago, because it was the only way to play while deployed at work. 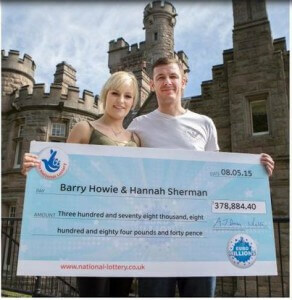 On Friday his efforts was rewarded by a £378,884.40 prize from EuroMillions. When his boss found out about it, he was sent home to collect his winnings. Rigs are too dangerous to allow distracted people to carry on working. Now he and his girlfriend plans to pay off the mortgage on the home they have recently purchased, and then perhaps they will book a holiday.